August 2008 – Route 79 Journal . Just about an hour by train southbound from London’s King’s Cross St Pancras station you will find an outer suburb of London called Lille, which happens to fall within French jurisdiction. One of the best things about this town, actually: THE BEST thing about this town is an art gallery called The Palais des Beaux-Arts de Lille, which houses the most important collection of fine art in France after the The Louvre in Paris. Personally, I like the Palais des Beaux Arts far more than Louvre, because a) it’s do-able in one afternoon, and b) the building and galleries are full of magnificent sights to behold. It’s exactly what you expect an art gallery to be like: vast spaces, wondrous paintings and sculptures, and most important of all; a sense of solitude that is the very antithesis of the tourist-packed Louvre. No being shuffled fast and furiously past paintings of the great masters here; you can hang around as long as you like and contemplate at some amazing works by Delacroix, David, Goya, Rodin, Van Dyck, Reubens etc. From a distance of a few metres, the object in the painting is recognisable to us Londoners in pin-sharp instantaneousness. But from a few centimetres away it looks like a hodge-podge mess of oil-paint randomness. 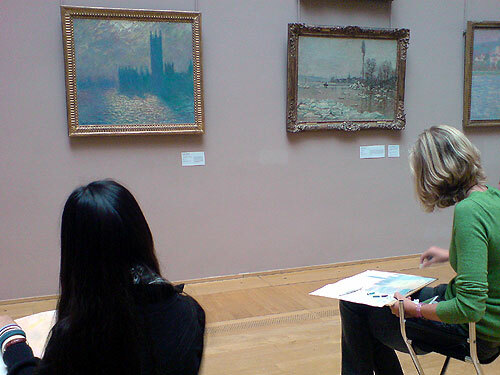 That’s the wonder of impressionism. That’s Claude Monet. And that’s what makes Lille a “must visit” place. Haven’t put up a recipe for ages. So how about chicken in a slightly different style. Not Indian style per se, but can be put together in any kitchen equipped and stocked for Indian cooking. It makes a great change and focusses on the wonderful combination of chickpeas and chicken. This combo is popular in the Mediterranean regions of Europe and North Africa, where the chickpeas are used liberally in meaty stews as well as salads. Contrast this with the use of chickpeas in South Asian and Indian cuisines, where chickpeas are used as a “centrepiece” rather than an ingredient – e.g. in chole bhatura or channa masala etc. Anyway, this recipe is a Moroccan style one, so plenty of use of chillie, turmeric, cumin and coriander, but with a really fresh Mediterranean edge through the use of olives, lemon, parsley and chickpeas. Click here to learn how to prepare this tasty dish. Best eaten al fresco in your back garden whilst a semblance of summer remains. A Word Cloud generated from this blog’s web-feed. Thanks to Paul Golding who showed me the way to this rather neat app.